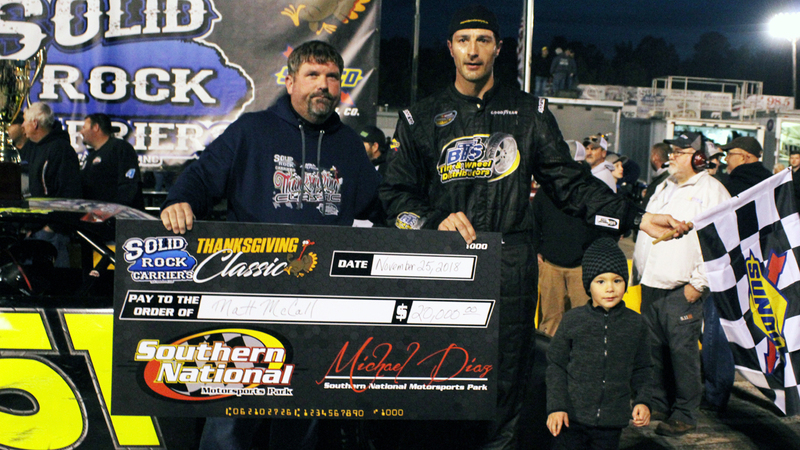 LUCAMA, NC – Matt McCall raced his way from the rear of the field to the lead in the final half of the Solid Rock Carriers Thanksgiving Classic, passing Deac McCaskill late and holding the four-time champion off to score the victory at Southern National Motorsports Park on Sunday night. McCaskill, 41, from Raleigh, had spent much of the first half of the race inside the top-five but was involved in a caution when a few lapped cars tangled in front of him. McCall, 37, from Denver, ended up spinning as well, off the front bumper of Bobby McCarty. Then, because he was involved in the caution, he was sent to the rear. McCall answered the challenge, roaring back to the front and rocketing past the leaders late – ultimately making the winning pass with three laps to go and edging McCaskill at the line. McCall and McCaskill, both veterans in the Late Model Stock Car discipline raced each other clean in the closing laps. McCall brushed the wall trying to hold off McCaskill on the final lap but was able to hang on for the win. McCall’s charge through the field was an inspired drive. At times, he was two-tenths of a second faster than the rest of the field. McCall spoke about driving through the field, stating he had only one goal at the Thanksgiving Classic – winning. Deac McCaskill had to settle for second. After the race, he spoke about his runner-up finish. While McCaskill was proud of the effort he and his team put forth in Southern National’s biggest race, he was disappointed to come up just short. “I just had one little wiggle off 4 and he got his nose underneath me, and there was nothing I could do,” McCaskill explained. “He got by me, and he got into the wall on the backstretch, and I had another great run on him. I was already committed to the high side, and it was just over from then. I have to sit on this all winter being that close to $20,000, but it was still a great run man. We got the pole, and we got the halfway (bonus). It was still a great night for us. I’m really proud of my team, but I don’t know what to say, man." McCaskill last won the race in 2006. His younger cousin, Bradley, finished in third while 2018 CARS Response Energy Tour champion Bobby McCarty, from Summerfield, came home fourth and Bahama’s Layne Riggs, son of Southern National legend Scott Riggs, rounded out the top-five. Wilson’s Adam Murray picked up the win in the Limited Late Model race on Sunday afternoon over 2018 Limited Late Model champion Andrew Grady from Knightdale, and 2018 Carteret County Speedway champion Brandon Clements from Swansboro. Goldsboro’s Clay Jones finished fourth while Franklinton’s Brian Obiedzenski finished fifth. Goldsboro’s Jonathan Kornegay won the Charger feature over Lucama’s Jeremy Bohne and Dudley’s Michael O’Brien. Alek Andrecs (Bandolero – Friday and Sunday), Jeremy Bohne (Charger - Friday), Karl Budzevski (Limited Late Model – Friday), Dennis Capps (Mod-4), Gary Ledbetter, Jr. (Street Stock), Jason Stephenson (U-CAR), Zack Miller (Legends), Jimmy Humblet (Modifieds), Ronnie “Buckshot” Jones (Mini-Stock), and EJ Kenny (Any Car).